is one of our most popular styles because of its traditional good looks. The distinctive roof overhang on the front with the sidewalls arching up to the overhang echo barn styles from a century ago. The Quaker style features plenty of headroom with its 78" sidewall and open rafters. It even has room for a loft to maximize your storage space. is a regal building and graces any backyard or garden with its lovely roofline. Add a cupola and flowerboxes for an extra special touch, and your building is sure to be admired by your neighbors. The excellent durability of the Cape (like all of our buildings) is the result of the quality components we use and our time proven construction techniques. 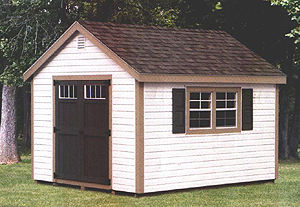 The Cape is also available as a Garage, featuring a heavy duty floor support system and steel overhead door. building is much like the Cape, but with a lower roofline. It offers great storage at a value that's hard to beat, and its clean lines flow well in urban, suburban, and rural landscapes. Consider the Cottage when you are looking for a Garage. It is available in sizes large enough for a car, boat, tractor or any other large equipment. Upgrade your garage with a ramp for extra convenience. 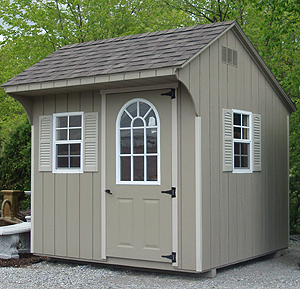 features a gambrel roof (barn-style) and a high side wall of 6'6". These two features combine to provide lots of headroom, helping your storage dollars stretch further. The high side wall allows you to add another door for additional access. Consider adding a loft to your Dutch Barn for expanded storage convenience. 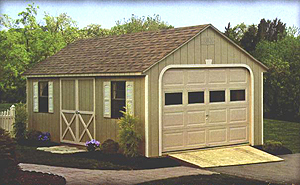 Choose a Dutch-style building as a Garage and have plenty of room for your vehicle, boat or lawn equipment! speaks genuine barn language. It will bring its own country charm to your backyard. 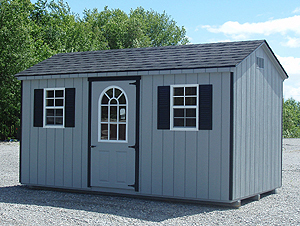 IMPORTANT: The Mini-Barn has a 4 foot high side wall, so make sure to evaluate your storage needs and determine which of our barns, Dutch Barn or Mini-Barn, will work best for you. 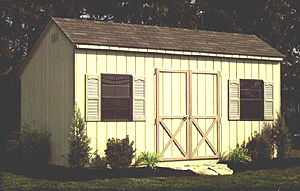 Side doors and large windows are not available on the Mini-Barn. View more Garages on our More Buildings page in various architectural styles: Cape, Cottage, and Dutch Barn. is available in your choice of architectural style: Cape, Cottage, and Dutch Barn. 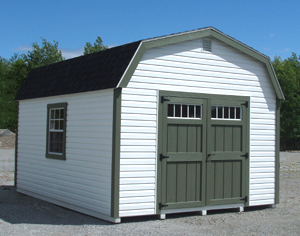 Our Garages are large enough to store a car, boat or any other type of large equipment. Upgrades for any style garage include a ramp for convenience and a loft for additional storage. NOTE: To order a Garage, specify the 'Garage Door Upgrade Option' on any of our Cape, Cottage or Dutch Barn buildings! is a timeless classic, adding a look of style and romance to any property. Functional and practical, the Gazebo offers a room out-of-doors, protected from both sun and rain. 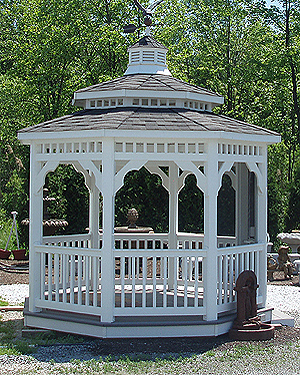 Blackburn carries white vinyl sided Gazebos for an elegant look, and pressure-treated stained wood Gazebos for a more rustic look. Either way, your yard is sure to attract attention! 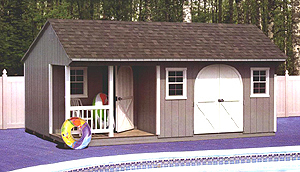 features a porch for sitting and lots of space for storing chairs, pool equipment and pool toys. It can also be configured with a separate changing room! With the added porch, this building is sure to add charm as well as convenience to your backyard pool area. 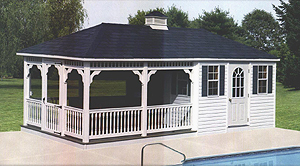 NOTE: The Poolhouse option (porch, railing and configuration) is available as an upgrade on our Quaker, Cape Cod or A-Frame buildings. combines the romantic look of the Gazebo with the 'front porch' charm and functionality of the poolhouse, creating a spectacular building for pool-side entertaining. The Cabana is available in many architectural styles and the colors can be coordinated to compliment your home and property. Stop by and browse our lot and catalogs. We'll show you how Blackburn's can customize a dream Cabana for your backyard! features an offset (Saltbox) roof, giving it a charming old-fashioned look. All of our options and upgrades are available with the Carriage House, so you can order it just the way you want. 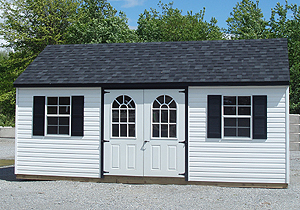 is a stylish outbuilding, configured perfectly for your pets or farm animals. You can choose a style and colors to match the other buildings on your property. 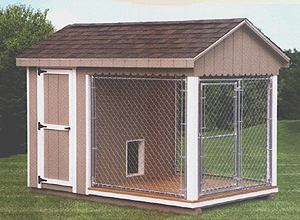 Attractive and low maintenance, the Animal Shelter is ideal for outdoor pets! 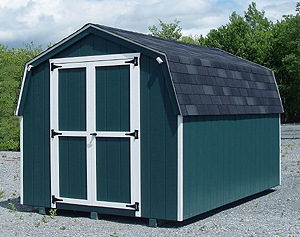 The actual shed and shingle colors may differ slightly from the colors that appear in your browser.